The bathing building of Chiu (source). One of China's western-most administrative divisions is the prefecture of Ngari, still part of the Tibet Autonomous Region, even though it's no less than 1600 km west of Lhasa, Tibet's capital. Sparsely populated (the 77,000 population can each claim 4 km2 per person), it's a wonder there is any information on hot springs in Ngari prefecture. That would have been the fact if the Tibetan holy mountain of Kailash would not be in the eastern part of this prefecture. Walking round this mountain (a kora) is part of Tibetan tradition which has attracted a number of travelers to do likewise. 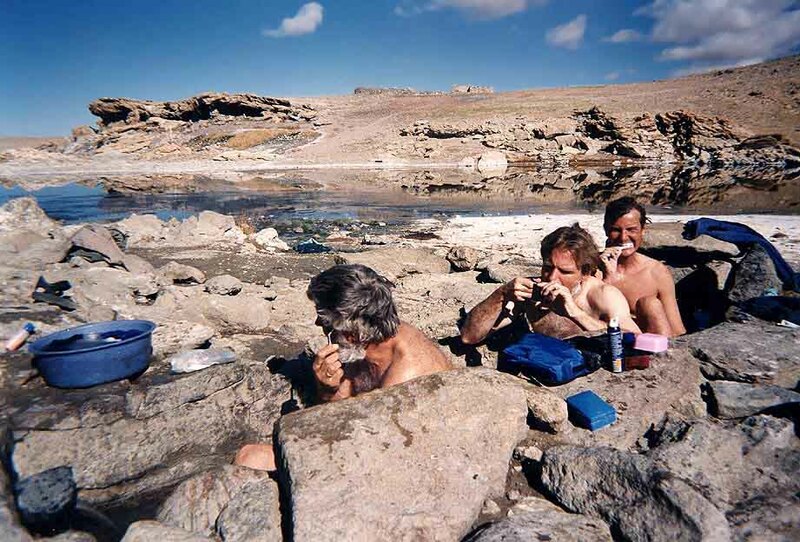 And so, a few hot springs thus stumbled upon have made it to the internet. 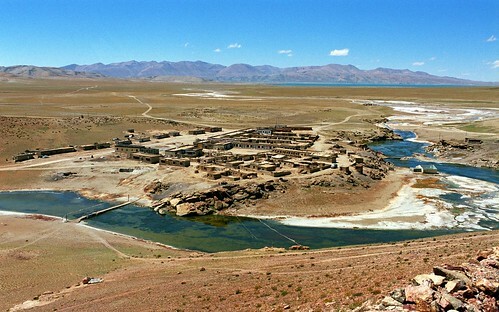 By far the most mentioned soak in this part of Tibet is the hot spring area of Tirthapuri, a not so Tibetan sounding name. Located in Burang county, conveniently situated, it's not too far away from the other pilgrim places of both Kailash mountain (just 80 km) and Lake Manasarovar and it's considered as the third (and final) leg of the trio kora. 'Tirthapuri' to Hindus, 'Tetapuri' to Tibetans, is the holy power place of the Hindu Goddess Parvati, the consort of Lord Shiva. It is the power place for the Goddess Bajra Barahi and Tara to the Buddhist. The hot spring here is the main holy sight for the pilgrims and it represents the female element, while Mt. Kailash, the male. 'Tirthapuri' considered the third holiest place in Ngari. This is where Heruka subdued Rudra, and according to Tantrism, this holy place is considered one of the 24 major power places on the sub-continent. It is renowned for its blessing of red and white earth from the hot spring'. Hot springs female, mountains male? 'Tirthapuri - a region known for medicinal hot springs and a geyser where in a story of Hinduism demon lost the fight to the god was burnt to ash, righteousness finally overcome the unrighteousness'. 'Located on the north bank of the Sutlej River, the Tirthapuri Hot Springs fill the barren landscape with steam. Pilgrims typically come here after completing the Kailash pilgrimage. They bathe in pools fed by the sacred springs, then visit the cave and monastery associated with Guru Rinpoche. Prayer flags stretch across the river gorge and chortens (stupas) add color to the landscape'. Unfortunately, this otherwise good website has little on the soaking experience itself. Despite this report from 2006 claiming the soaks to be 'extremely hot', LP's Tibet guide adds that the hot springs are getting weaker and weaker every year, though possibly this refers to the accompanying geyser. Then again it may be the reason why there's little recent info. 'From one of the blowholes, however, small white flecks or 'pills' of lime can be found. Tibetans strain the water for these and use them for medicinal purposes, since they are said to have a consecrated power to cure disease'. Beauty in Divine has an extensive posting on Tirthapuri, though not first hand? Nearer Kailash mountain are a number of other hot springs. Chiu (Chiyu or even Quhu) hot spring seems to be the most often frequented. 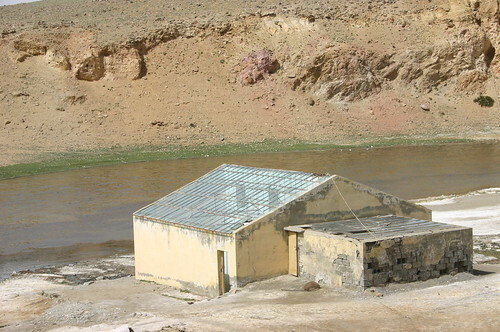 Located near the monastery with the same name this hot spring actually has its own bathing building complete with glass roof (see top picture). The village of and surrounding Chiu Gompa. Note the bathing building on the right near the building (source). 'As it turned out all the baths either had big gaping holes in them, and none had plugs. They had never been cleaned and the hot spring water came trickling through a spout from a wall. Michael managed to stuff up his drain hole and had a happy full bath. Paul and I had no success. Although feeling sick, I was determined to keep calm as I knew I was extremely privileged to be on the top of the world at one of the holiest sites'. For a different experience, look at the photo (below) by Rolf Gross, dating from 1995 probably before development of the site took place. '... a small collection of gushing geysers, bubbling hot springs, puffing steam outlets, and miscellaneous smoking holes in the ground'. With the single reference (1), Qoipur (Burang) is something of an anomaly. Little regard for soaking, though there is a geyser which is rumoured to have blasted 900m high, once in 1975. Seeing is believing? 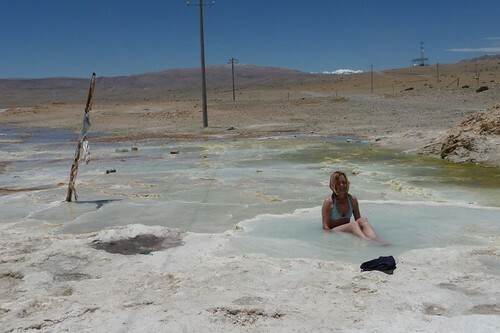 The hot springs of Gyagar are located (link not working) just inside Ngari prefecture. Little other info.